It is official! The quilting is done on Miss A’s Quilt! I’m not sure about everyone else, but I feel rather accomplished. I decided to go with the zig-zag theme of the bargello pattern I did, and then in the border I just wanted some fun asymmetrical lines and angles. I wanted the border to contract the symmetry on the body of the quilt. All in all, I think I did a good job! I’m really happy I chose the blue thread, and I really enjoyed the way it came out. 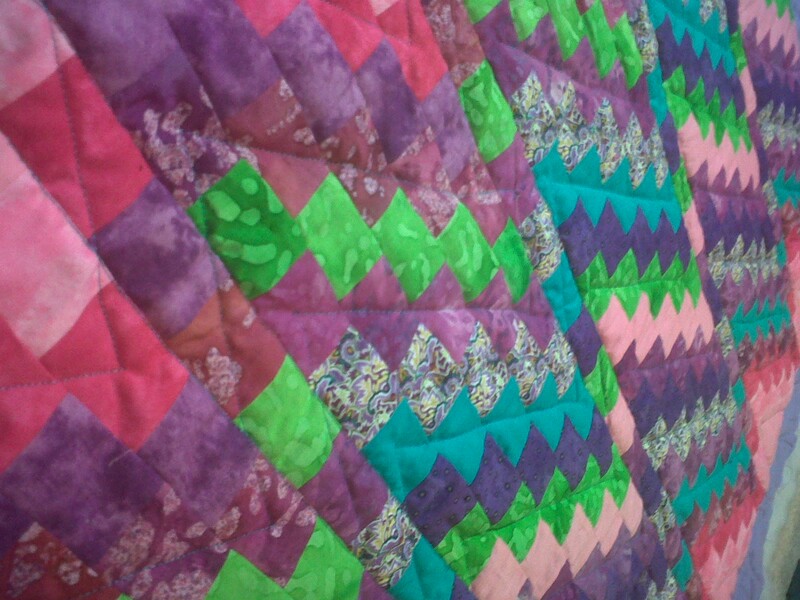 However, on a more comedic note, When Miss A’s mom saw me pinning the quilt, she asked about the backing. I chose a hideous flannel that has a plaid print on it. She asked if I ran out of matching fabric. I told her I chose this fabric for 3 reason. 1) I had it… 2) It’s super soft… 3) It’s going to be so ironic! Miss A is a super sassy toddler, so I feel like when she gets older she will appreciate the irony of it all! I hope so anyways!